Pricing determines what a company receives in trade of its products. Pricing is key element of the marketing mix including product, place and promotion. It is indeed crucial to pick a proper pricing tactics to maximise income and profit. Companies adopt pricing strategies according to goals and objective of marketing. The different market systems undertake specific pricing techniques. Premium pricing strategy establishes a price higher than the competitors. it's a tactic that can be effectively used when there is something unique about the product or when the product is first to market and the business has a distinct competitive advantage. Premium pricing can be a good strategy for companies entering the market with a unique product and hoping to maximise revenue during the early stages of the product life cycle. A penetration pricing strategy is designed to capture market share by entering the market with a low price relatively to the competition to attract buyers. The idea is that the business will be able to raise awareness and get people to try the product. Even though penetration pricing may initially create a loss for the company, the hope is that it will help to generate word-of-mouth and create awareness amid a crowded market category. 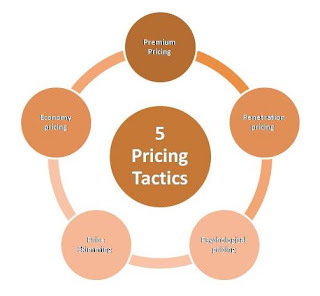 Economy pricing is a familiar pricing strategy for organisations where they take a very basic low-cost approach, marketing-nothing fancy, just the bare minimum to keep prices low and attract a specific segment of the market that is very price sensitive. Business that have a significant competitive advantage can enter the market with a price skimming strategy designed to gain maximum revenue advantage before other competitors begin offering similar products or product alternatives. In this strategy wile launching a product company sets high price for a product initially and then reduce the price as time passes by so as to recover cost of product quickly. Psychological pricing strategy is commonly used by marketers in the prices they establish for their products. For instance, INR 499 is psychologically "less" in the minds of consumers than INR 500. It's a minor distinction that can make a big difference.